Mimma is a musical about the meeting of two very different minds and hearts: two women from very different cultures, with very different aspirations, whose friendship transcends the conflict between their nations, and endures the ravages of history. The musical itself is also the product of a chance meeting of creative minds. 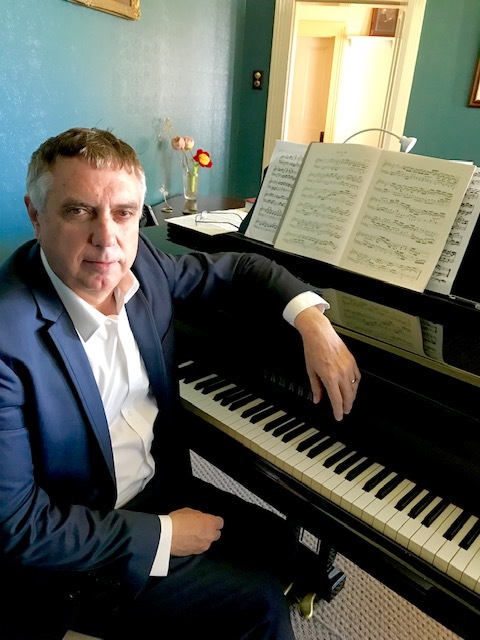 Ron Siemiginowski, Mimma’s composer and producer, was originally a touring classical pianist and musician, and is now owner of Orana Cinemas in WA. After a chance meeting at a recording studio, it became evident that Ron and I shared a lifelong ambition to write musical theatre. During that first get-together at Ron’s house in Albany, he played on his grand piano the melodies he had already written: an Italian rhumba, the beginnings of operatic arias, and tunes which seemed to belong in the London of the late 1930s and early 1940s. The meeting of minds bore instant fruit. As Ron played, I began to write a flow-chart which would eventually become the plot for Mimma. The 1940s style and the Italian influence took me back to my own doctoral studies of Britain during the Second World War. Ever since then, I had felt that the British government’s decision to intern anti-Fascist Italians, Germans and even Jews after Mussolini’s declaration of war in 1940 was one of the great and largely forgotten ironies of history. This process had culminated in the sinking of the Arandora Starby a German U-boat. The converted passenger liner was deporting ‘enemy aliens’, including many vocal enemies of Hitler and Mussolini, from Britain to Canada, when it was hit by a torpedo, with the loss of 865 lives. It was a story, long forgotten by many, which I had long hoped to tell. As I listened to Ron’s music, characters emerged in my mind: a young Italian woman journalist, exiled to Britain in 1938 because of her anti-Fascist views; her mother and her brother, who would later participate in the genesis of the Italian Resistance; her uncle, an Italian immigrant to London and the owner of a nightclub in Soho – and his vivacious English employee, a singer who would soon be a rising star. In the months that followed, the story of the two women, who would eventually be named Mimma and Sarah, inspired new songs, as Ron and I immersed ourselves in wartime Italian and British culture. There were strong personal connections for us, too, in our family histories. As young adults, Ron’s own family had endured life in Nazi-occupied territory, and my own parents’ childhoods had unfolded against the backdrop of the wartime British home-front. My father still has the wooden Spitfire, Messerschmitt and Heinkel which my grandfather, a carpenter, had made for him to play with, and these too were the inspiration for a song called ‘Spitfires and Hurricanes’. In the context of current migrations and the plight of modern refugees, the story only seemed to gain relevance as we wrote. Wars bring out the best and the worst in people, and officials in times of conflict can play roles which are either heroic and compassionate, or exactly the opposite. It is as though war casts a gigantic magnifying lens on the contradictions of human nature, and Ron’s music and my words gradually began to breathe life into characters who would live these contradictions. A part of our own experience, too, is the enormous benefit conferred on Australia by its Italian immigrants, who entered our country through Fremantle port both before and after the Second World War. It became obvious during the writing process, that this was the final inspiration which would draw the different strands of our story together. The story of how Mimmacame to be written would not be complete without mention of the extraordinary generosity of spirit which Ron has shown in pursuing this shared dream. Ron has succeeded in drawing together a team which includes some of Australia’s most talented opera singers, one of its foremost dramatic directors, Adam Mitchell, and an orchestrator, Sean O’Boyle, who is perhaps the most prolific musician in the country. It has been a consistent delight to work with all of these people, and to know that in the process, we have created something beautiful and unique. MIMMA: A Musical of War and Friendship, will have an exclusive session at Perth’s Regal Theatre from the 9th – 21st April, 2019.